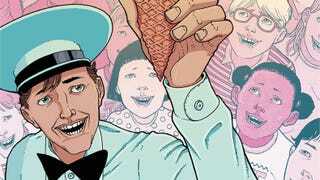 The jingle of an ice cream truck usually means that something sweet and refreshing is on the way, but the new Image Comics title Ice Cream Man offers up something very different when the titular figure appears. A series of self-contained one-shots by writer W. Maxwell Prince, artist Martín Morazzo, and colorist Chris O’Halloran, Ice Cream Man introduces a new cast of characters with each issue, exploring the darkness inside the human spirit as well as the light that brings redemption. W. Maxwell Prince’s One Week At The Library received an Eisner Award nomination this year for Best Short Story, and Ice Cream Man continues to showcase his skill for crafting concise, contained tales that pack a lot in a limited page count. Artist Martín Morazzo has drawn political thrillers, surreal crime stories, and spectacular superhero adventures in the past, and his versatility makes him a great fit for this genre-bending story. He previously worked with Prince on IDW’s The Electric Sublime, and they’ve developed a rapport that pushes both of them as creators. There’s an ominous quality that permeates this exclusive preview of Ice Cream Man #1, as an unsettling darkness that is encroaches on the suburban setting. Chris O’Halloran has quickly become a highly sought-after colorist, and these pages highlight why with strong contrast, smooth rendering, and just the right amount of gritty texture. Readers can uncover the mysteries of Ice Cream Man when the first issue goes on sale January 17, but in the meanwhile, here’s a first look at what’s in store.